All Campo homes currently listed for sale in Campo as of 04/21/2019 are shown below. You can change the search criteria at any time by pressing the 'Change Search' button below. "This 427 acre ranch is unlike anything else you will find in Southern California. As you drive through the gated entry you will be immediately be drawn to the beautiful oak groves, large pastures, meadows, and rolling hills. You ll notice the amazing Tudor style architecture of the 3,200 sq ft 3 bed/2.5 bath home that sits elevated above the Ranch grounds with breathtaking views of the pastures below. Second home is a 2,400 sq ft 3 bed/2 ba. 12 stall horse barn, 12 parcels, see supp remarks... Neighborhoods: Campo Complex Features: ,, Equipment: Range/Oven Other Fees: 0 Sewer: Septic Installed Topography: ,,LL,,RSLP Guest House Est. SQFT: 2000"
"UNIQUE OPPORTUNITY IN BEAUTIFUL SETTING An original 160-acre patent ranch that was once owned by 1940 s movie star Tim Holt. Many uses - perfect for Horse Ranch. 5 bedrooms incl lg master bedroom, 3 full baths, lg separate living, family and dining rooms all with vaulted ceilings, lg kitchen w/ utility storage. Big country front porch runs length of ranch house exceptionally comfortable and relaxing. Solar heated pool - pool house doubles as separate guest house. Numerous outbuildings. The main well Neighborhoods: La Posta Complex Features: ,,, Other Fees: 0 Sewer: Septic Installed Topography: LL,GSL"
"Incredible opportunity awaits at this secluded 40-acre, park-like oasis located in the heart of San Diego County s backcountry community of Campo. Nestled amongst majestic, mature oaks, this site welcomes its visitors along a meandering dirt road, easily accessed off of Hwy 94. The oak canopy provides incredible privacy and serenity for the 2 bedroom, 2 bath mobile home with large deck overlooking one of two ponds. Stunning native rock outcroppings throughout the property frame the lower pond and host a year-round waterfall, making this a true backcountry oasis. With an abundance of water, privacy and useable space, this property captures the natural beauty of the area. Come explore all that this unique setting has to offer and realize your dream here today!" 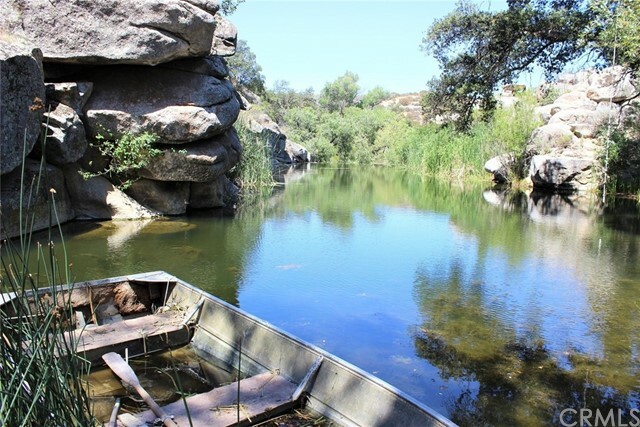 "Incredible opportunity awaits at this secluded 40-acre, park-like oasis located in the heart of San Diego County s backcountry community of Campo. Nestled amongst majestic, mature oaks, this site welcomes its visitors along a meandering dirt road, easily accessed off of Hwy 94. The oak canopy provides incredible privacy and serenity for the 2 bedroom, 2 bath mobile home with large deck overlooking one of two ponds. Neighborhoods: Campo Other Fees: 0 Sewer: Septic Installed Topography: LL,GSL"
"AMAZING 160 ACRE RANCH/FAMILY COMPOUND THAT INCLUDES GORGEOUS MATURE OAK GROVES, POOL, MOUNTAINS, STUNNING VIEWS, WELL, ALONG WITH 3 HOUSES. INCREDIBLE OPPORTUNITY FOR DEVELOPMENT, COMPANY RETREATS, ETC. THIS PROPERTY WAS USED AS ARMY BARRACKS MANY YEARS AGO. THE SALE INCLUDES 3 SEPARATE PARCELS. LOCATED BEHIND THE CAMPO HILLS COMMUNITY AND THE CAMPO RAILWAY MUSEUM. Neighborhoods: CAMPO Other Fees: 0 Sewer: Septic Installed Topography: LL,,RSLP,GSL,SSLP,"
"Beautiful Custom Built home with 360 degree views. Enter the fully fenced interior yard with concrete walking paths. Walk up to the over sized covered porch . Enter the door into the formal entry complete with half bath and coat closet off to the right is the formal living room and dining room . In front of you boast the grandiose family room with large open beam ceiling , rock gas fireplace with built in showcases and mantle. Terra Cota Tile through out the home. Family room - see supplement below Neighborhoods: campo Equipment: Range/Oven, Shed(s) Other Fees: 0 Sewer: Septic Installed Topography: LL"
"Just remodeled inside and out !! Hardwood floors Solid surface counter top, New appliances, New HVAC, Beautiful inside with all the goodies..... Exceptional views, Large covered back porch and walled front porch. THIS IS A MUST SEE !! Neighborhoods: Campo Other Fees: 0 Sewer: Septic Installed Topography: GSL"
"Experience true country living in this quiet 3-bedroom, 2.5 bath, 2,613 sq. ft. home sitting on 8 acres surrounded with open space. Ceiling fan in the new master bathroom, walk in pantry, wood-burning fireplace in the great room. Two large A/C Dual Zone. Walk in closets in Extra-Large Master suite s sitting room. The home also features an over-sized detached 3-car garage with a bonus room to use as a work-space. RV Hook ups in separate fenced area. Enjoy this country escape not far from the city. Neighborhoods: Campo Other Fees: 0 Sewer: Septic Installed Topography: ,LL,,RSLP,GSL"
"This home was built in 1971 and has commanding views of Campo Valley. Property includes the original equestrian facilities of the mounted 11th Cavalry. Included are the magnificent stables with original markings and feeding troughs. 4 plus usable acres with large riding arena. Whole house vacuum, Guardian back up generator, detached garage, huge family room with wood burning stove, work out room, fenced and cross fenced for horses, dogs, etc.. City water and sewer. Neighborhoods: Custer Complex Features: , Equipment: Dryer,Garage Door Opener, Vacuum/Central Other Fees: 0 Sewer: Public Sewer Topography: GSL"
"Location and view! Brand new home perfectly situated on the hill to take advantage of a 360 degree view over green pastures & the historic Old Mill in Campo. Enter your new home off the highway to a quiet graded road. Enjoy a cold drink on your patio overlooking green open space, distant mountains and peaceful views in every direction. Spacious 3 BD 2 BA home with kitchen-family room combo & cozy fireplace. Enjoy your expanded kitchen island with shiny new appliances perfect for food prep and parties. Neighborhoods: Campo Other Fees: 0 Sewer: Septic Installed Topography: GSL"
"New home with terrific floor plan on 1.9 acres. Stunning views of green pastures across the road. Just off Highway 94 in the rural town of Campo. 3 BD, 2 BA with large closets and plenty of storage. Wonderful family combo kitchen and family room with cozy fireplace and patio door opening to ample back yard area. Master suite separated on one end of the home with luxury bath, separate shower, and lots of closets. Popular color choices make it easy to decorate and enjoy. Neighborhoods: Campo Equipment: Range/Oven Other Fees: 0 Sewer: Septic Installed Topography: LL"
"Only 7 miles from the 8 East Buckman Springs exit and less than 3 miles from the popular vacation spot Lake Morena, this lovely home sits on over half acre of useable land. The deck in the backyard overlooking a beautiful pond is perfect for summer barbecues. There's ample parking for RV, boat and other vehicles. The two stall barn is a big bonus for animal lovers. There's plenty of space to grow more fruit trees or to put an income producing mobile/manufactured home. You'll fall in love with this home! Neighborhoods: Lake Morena Other Fees: 0 Sewer: Septic Installed Topography: LL"
"Cozy 2 bed, 2 bath on 14.73 acres of land. Great for a grove, vineyard, ranch, or horse property. This property is mostly flat with some areas of gentle slope. Get off of the grid and enjoy the beauty that Lake Morena has to offer. Beautiful 360 degree views. Owner has animal pens and a 8x20 storage shed that will convey. Home has stucco siding, dual pane windows, laminate wood flooring in kitchen and bedroom #1, and a newer 40 year roof. Water is supplied by a well and pump on property which has recently Neighborhoods: None Complex Features: , Cooling: Swamp Cooler(s) Equipment: Shed(s) Other Fees: 0 Sewer: Septic Installed Topography: LL,GSL"
"Adorable newly renovated 2 bed/2 bath with a 12x19 garage conversion. Great space! Granite countertops, refinished cabinets, new carpet, porcelain tile, extra finishes throughout. 2 storage sheds. Laundry room. Private lot! Great starter home! Come check it out!! Neighborhoods: Campo Other Fees: 0 Sewer: Septic Installed Topography: LL"
"Off the beaten path and tucked in on a less traveled road in Lake Morena Village is a brand new home. Private dual master suites, perfect for room mate situation. 2 BD 2 1/2 BA, huge walk in closet, chef's kitchen with center island, shiny new appliances. Patio door opens to a large raised deck in the back yard. Fenced yard with strategically placed boulders to enhance your landscape. Sidewalks surround the home. Wonderful, quiet neighborhood. Nice walk to the lake. Neighborhoods: Lake Morena Equipment: Range/Oven Other Fees: 0 Sewer: Septic Installed Topography: LL"
"Wow, Most affordable home on the market! Newer home, nicely done and well maintained. Large open floor plan, living room with vaulted ceilings and fireplace, located on quiet street in very safe gated community. House has wonderful views, lots of open space. Great community, quiet and friendly. Community pool, hot tube, playground and recreation area. This is a wonderful place to raise a family. Won't last!! Neighborhoods: Campo Hills Other Fees: 0 Sewer: Sewer Connected Topography: LL"
"Welcome home to Campo Hills! Custom stack-stone exterior greets you from one of the best lots in the complex. There are no neighbors behind you- just views forever! The formal entry is flooded with natural light and leads you into the updated kitchen that boasts custom cabinets and granite counters. The layout of this home is great with huge master on one side, and two additional bedrooms and a bath on the other. The community is fully gated and features basketball court, playground, and a pool. Neighborhoods: Campo Hills Other Fees: 1670 Sewer: Sewer Connected Topography: LL"
"RANCH STYLE PROPERTY 19.85 ACREAGE. ROOM FOR HORSES, LIVES STOCK, OAK TREES AND SEASONAL CREEK, CATTLE, Neighborhoods: CAMPO Complex Features: ,,, Other Fees: 0 Sewer: Septic Installed Topography: ,GSL"